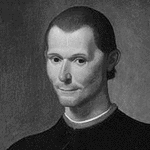 Niccolo di Bernardo dei Machiavelli was an Italian diplomat, political philosopher, musician, poet, and playwright. He is a figure of the Italian Renaissance and a central figure of its political component, most widely known for his treatises on realist political theory and republicanism. The Prince is a simple and straight forward political guidebook for the ruling of autocratic regimes based on the first-hand experiences of Niccolo Machiavelli. The Prince was originally published in 1513 and represented an important departure from previous thought. It is seen as part of a larger transition from medieval scholasticism to Renaissance humanism. FCIT. "Niccolo Machiavelli author page." Lit2Go ETC. Web. 19 April 2019. <https://etc.usf.edu/lit2go/authors/47/niccolo-machiavelli/>. FCIT, "Niccolo Machiavelli author page." Accessed April 19, 2019. https://etc.usf.edu/lit2go/authors/47/niccolo-machiavelli/.